Before we all had unlimited amounts of games on our mobile devices, Windows 98 had the iconic Solitaire game. We could waste entire days dragging and stacking those cheesy, pixellated cards all over the screen. While computer solitaire graphics have vastly improved since then, we’ve still got a nostalgic soft spot for that old game. 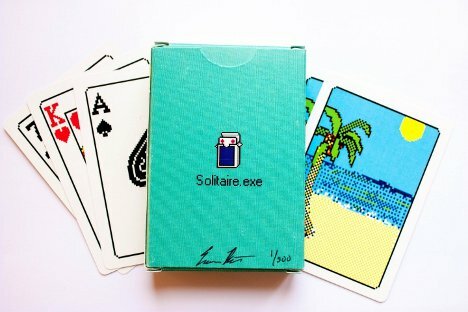 Evan Roth brought back the iconic card game with the Solitaire.exe card deck. 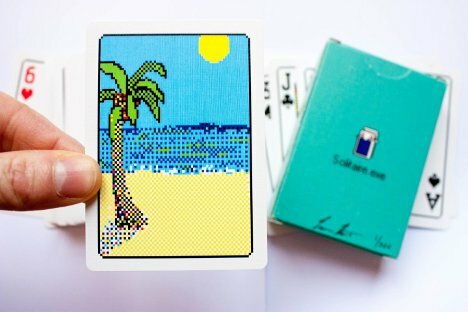 The deck is a faithful pixel-by-pixel recreation of the classic Windows solitaire game, down to the sweet beach scene on the backs of the cards. Roth got special permission from Microsoft to use the immediately recognizable card faces and backs before creating the limited edition of just 500 decks. Sadly, the cards all sold out quickly – but maybe with enough demand the designer will be able to bring them back, allowing all of us to play the classic game in meatspace. See more in History of Tech or under Vintage & Retro. November, 2012.